Police say they are looking for one man who fled the scene on foot with a black handgun, possibly wearing a dark hoodie. He was last seen heading west on Pearl St.
A man who was found without vital signs following a shooting inside a downtown restaurant Saturday evening has died. Police rushed to Michael’s on Simcoe near Simcoe St. and Adelaide St. W. around 9 p.m. after reports of shooting. When emergency services arrived, they found a man without vital signs. Paramedics rushed him to a hospital where he later succumbed to his injuries, police said. 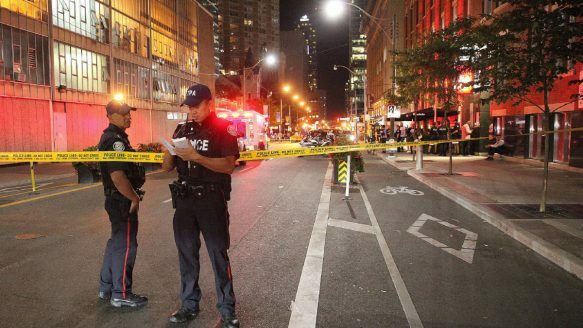 Witnesses told police they heard four to five shots fired when the shooting took place within the restaurant, which is located in Toronto’s entertainment district. Police are looking for one male suspect who fled the scene on foot. He is described to be in possession of a black handgun, possibly wearing a dark or grey hoodie. He was last seen travelling west on Pearl St. The Homicide Unit has taken over the investigation. They are asking for anyone who might have witnessed the shooting to contact police or Crime Stoppers. The restaurant was the scene of another dramatic shooting almost two years ago. Police described that incident as a targeted act. Two masked men entered the restaurant and opened fire, hitting a man and woman in their late 20s sitting at the back of the restaurant, police said at the time. Both victims survived the shooting.